Sunday 16th December: Made it to Iwaki, staying with a host in Onahama, a small village nearby. Should be back in Tokyo in a couple of days. Saturday 15th December: A rotten day. Cycling in the rain, Emily was turned back as she reached the 20km exclusion zone that’s been set up around the Fukushima nuclear power station. She was further challenged by difficult navigation through the tsunami damaged terrain. Camped near Towa, cold and damp. Friday 14th December: After yesterday’s detour out to Matsushima and back, Emily left Sendai this morning and, after a difficult day with head wind and continuing problems with her back wheel, she reached Soma, camping at a service station just a little further on. Wednesday 12th December: And today she made it safely to Sendai in Japan. The weather has improved – it’s dry and sunny ! Tuesday 11th December: Having reached Murayama today, Emily is staying in a service station. Conditions remain wintery to say the least, but she finally rode out from under the clouds about half an hour before the end of today’s ride. Monday 10th December: Today Emily has set off from Akita and experienced the worst conditions she’s ever cycled in – couple of feet of snow, narrow unploughed road, riding on ice the whole time, sometimes not even able to ride, traffic far too close, blowing a blizzard, etc. Despite this she is in good spirits. She has abandoned plans to ride up to Lake Tazawako and is now heading south towards Sendai. Saturday 8th December: Emily “was not damaged by the earthquake, but after several long days of wind and rain and hail and snow and sleet and ice and failing waterproofs and leaking tent and worn-out brakes pads and snapping spokes, is very glad to be tucked up with a kind WarmShowers host in Akita, warm and dry and being fed almost constantly.” Not sure what happens next. Thursday 6th December: Last night Emily camped under a bridge near Niigata. Heavy rain for the last 24 hours has left her soaked. Her tent was flattened by wind this morning so a very early start. There are still two long days’ ride to get to the next host, in Akita, but someone has taken her in tonight, which should be an improvement on last night. Tuesday 4th December: After leaving Jomokogen on Sunday, Emily reached Sakai and today has reached Sakaemura. Snow everywhere, and more forecast, but not too cold. Saturday 1st December: Emily left Tokyo yesterday heading north-west on her Post-Tokyo Loop around northern Japan. Today she’s reached Jomokogen. It’s mountainous and it’s cold. Monday 5th November: Today Emily rode into Tokyo where she plans to settle a while before heading further north. And after Japan ….. well that’s not really clear yet. Sunday 4th November: Yesterday Emily reached Shimizu. Today she enjoyed views of Mount Fuji, rode to Mishima and then over the hilly Izu Peninsula to Atami. Thursday, 2nd November: After a day off, Emily left Kyoto yesterday lunchtime and rode along Route 1 as far as Koka. Today she rode on to Toyohashi – a very long day. Camped in a small park by the river. Tuesday, 30th October: Took boat across to Akashi and stayed on route 2 for most of the day. Eventually got on the 171, arriving in Kyoto late after some navigation issues. Bivvied in Maruyama Park. Monday, 29th October: Left Higashikagawa, followed route 11 along the coast, and then turned onto the 183 to meander through the islands. Beautiful coastal scenery, picturesque villages and lots of steep hills. Hungry. Camped next to the rainbow bridge across to Kobe. Sunday 28th October: Yesterday Emily rode over the Tatara Bridge as dawn was breaking, arriving in Onomichi to meet up with more friends for a ride before heading back to Imabari (in the pouring rain). Up early this morning and finally caught up with Kate & Jen in Higashikagawa. Detour over. Friday 26th October: Emily set off from Matsuyama this morning, after camping in a small park next to the ferry terminal. She rode out across the islands towards Onomichi, stopping at Tatara Bridge, about 40km short …. a bit of a detour. Thursday 25th October: Caught the ferry to Matsuyama, Japan this afternoon, and will spend 3-4 days exploring the north coast of Shikoku. Tuesday 23rd October: Kokura to Tokuyama (near Shunan). Camped in a park on a hill under a windmill. Monday 22nd October: Slowed by ill-health within the group. Limped as far as Kokura, camped in the castle grounds. Sunday 21st October: Rode as far as Wakamatsu Bridge and camped in a hilltop park. Saturday 20th October: After a brisk ride into Fukuoka, Emily met up with friends for the ride north, camping just a few miles further north. Friday 19th October: Camped last night at Yukuhashi and today headed into the hills camping a couple of miles short of Koishiwara. Thursday 18th October: Lecture delivered, back from Hong Kong to Busan in South Korea and today Emily caught the ferry over to Shimonoseki in Japan. From here she’ll be heading towards Fukuoka, meeting up with friends to share the ride north. Tuesday 9th October: After a brief spell in Busan in South Korea, Emily is parking up and flying back to Hong Long to deliver a lecture at the RGS. Sunday 6th October: More exploring down the east coast of South Korea, camping wild and staying last night somewhere between Jinha and Sinam. Heading for Busan. Thursday 4th October: Emily reached Gangneung in South Korea on Sunday and then moved off down south on a leasurely pootle, camping on the edge of Samcheok and then near Maehwa and Jangsa beach tonight. Sounds like a holiday ! Friday 28th September: And after a few days rest Emily moved on yesterday, camping about 60km south of Chuncheon. She continued today, but didn’t get as far east from Chuncheon as she would have liked as she hit some mountains and got caught in the sort of rain that just chucks it down. She’s camped in a shed next to a friendly petrol station and the lady who runs it (and her daughter) have invited her in for a plate of sausage & bacon and they’ve opened a bottle of wine. Monday 17th September: Emily arrived in South Korea today. Saturday 15th September: A relatively short ride to the ferry port and Emily is now in her final hours in China, ticket in hand, she’ll be sleeping at the port ready for tomorrow’s voyage. There is a typhoon forecst over South Korea and we’re hoping that doesn’t become a problem for her arrival on Monday. She covered 9,200 miles in the first year and then around 1,050 miles in the past 11 days – that’s more of a sprint than a bike ride. Friday 14th September: A final big push and Emily has stopped tonight just 35k short of Tianjin and has just 100k to ride tomorrow to get to the ferry port from which she’ll leave China for South Korea. The 11 day dash has been something of a challenge and let’s hope we get a blog post on that one once Emily recovers. Thursday 13th September: There’s been limited communication, but I do know that the past two days have been “colourful”. What sounds like a hard slog has delivered Emily just 25k short of Baoding in China. I make that 900 miles in nine days. Not far to go now. Tuesday 11th September: Emily continues to make progress towards Tianjin. After a better day today she reached Taiyuan, but covered in black mud, from head to foot. That’s 673 miles in 7 days – 96 miles per day. Monday 10th September: Bad day, rain, mud, hills and a puncture, but at least that’s half way through the 11 day dash from Lanzhou to Tianjin. Emily’s been taken in by a friendly family in Lishi. Sunday 9th September: And again. Yet another day of 90 miles plus and Emily is camping just a little west of Suide in China. Saturday 8th September: Another big day and Emily has reached Jingbian. She’s worked out that she’s three (long and potentially mountainous) days’ ride from Taiyuan, and then she has to to make it to Tanggu in four days from there, which might mean riding through the night. Friday 7th September: A big push yesterday and again today sees Emily at Yanchi. Three days done, eight more to go. Wednesday 5th September: Routemaster holidays are over ! Yesterday Emily arrived back in Lanzhou after the two-day train trip out of Hong Kong. Early this morning she set out on the eleven day dash to Tianjin on the east coast where she’ll catch a ferry to South Korea. Today she made a hefty dent on that 1,500k, stopping around 20k north of Pingchaun. Thursday 19th July: Emily has reached Lanzhou in China, where she will park her bike and head off on the train to Hong Kong to get a new visa. No more updates for a couple of weeks, not until that bike starts moving again. Friday 13th July: Reached Xinging in China, which turns out to be a bit of a culture shock. It’s a big city, full of skyscrapers and traffic, and Emily’s been out in the wilderness for a week or more. Probably a bit of a rest here before pushing on towards Lanzhou. Thursday 12th July: Two more days of riding amazing terrain deep in rural China, with passes topping 3,800 metres, skirting the southern cost of Qinghai Lake, staying tonight at Jiangxigouxiang. Still heading for Xinging. Tuesday 10th July: Since leaving Dunhuang, Emily has cycled for five long days heading towards Xining in China, maybe another four days to go. Passing through Da Qaidam and Delingha, she is now camped in a barley field somewhere further along the road. Friday 6th July: Left Dunhuang today, got back on the road heading south, camped on the edge of some mountains, trying to avoid a thunderstorm. Saturday 30th June: Emily made it to Hami in China yesterday, where she’s taking a rest day today, keeping out of the heat for a while in an air-conditioned hotel room. I think she probably deserves that. Thursday 28th June: Emily is still heading east through the desert towards Hami in China – it’s very very hot. Hosts and folk along the way are being wonderfully supportive, but it’s been tough and it will be good to get into Hami for a break and some serious refreshment – Hami’s meant to produce the best melons in the world. Tuesday 26th June: “A much shorter day today, from Turfan to Shanshan. Heat, headwinds, hills, hard work – that’s probably going to be the theme of the next two weeks! Tan lines are already ridiculous.” Emily is now heading for Hami, China, which is probably around three days away. Friday 15th June: A final push through headwind covering around 100 miles in around 18 hours has taken Emily to Urumqi where she’s being looked after. A big rest is in order so updates may go quiet for a while. Hope we get a blog post on the Taklamakan desert. Thursday 14th June: Camping outside police stations and service stations along the road through the desert, Emily has continued east towards Urumqi, China. After another 86 miles yesterday and 99 miles today, she has just a day or two to go. She’s now crossing the eastern tip of the Tian Shan mountain range and will then descend all the way down to sea level and beyond, skirting the Turpan Basin, which contains the second lowest point on earth. It’s apparently like a fan oven down there, very hot, very windy ! Tuesday 12th June: After Sunday’s rest day, Emily set off heading east through the desert. Yesterday’s 81 miles and today’s 87 miles has taken her to Korla, China. “Today’s wind was mostly from the side, which is almost more hard work than a headwind, because every gust is like a great big invisible hand trying to push you off the bike”. Still on target to reach Urumqi within the next few days. Saturday 9th June: Another big day in the saddle saw Emily cover the 87 miles to Kuqa, China. The motorway continued through the Taklamakan desert and it’s been hot and windy. Now around halfway between Kashgar and Urunqi, she’s been pushing it a bit over the last few days and is need of a rest day tomorrow. Friday 8th June: Back on the road towards Urumqi, China. After a day of two halves, moving through poplar-lined avenues, populated, with villages, fields and orchards, followed by an unexpected new motorway, running through featureless desert, with wind from every direction and absolutely no sign of civilization. Camped in a partly built service station. No idea where she is, just 76 miles further along the road. Thursday 7th June: Today Emily rode the final 80 miles into Aksu in China where, after a lengthy search for somewhere to stay she found a policeman who escorted her to an upmarket hotel. “More than I’d like to pay, but there was no other option, and I intend to make the most of it, crisp white sheets and all. Have been camping rough the last few nights, so I think I deserve this.” The outline plan from Aksu remains the journey to Urumqi. Monday 4th June: After a well earned break in Kashgar in China, Emily set off in a north-easterly direction towards Urumqi, a ride which will probably take about two weeks depending upon how challenging the northern edge of the Taklimakan dessert turns out to be. Her update after the first day reads: “About 62 miles into the desert. Evil headwind, sunburn, saddlesore, and two punctures (that doubles my total for the trip). Staying with an old Uighur couple in a tiny oasis. Very very tired. It’s great to be back!”. 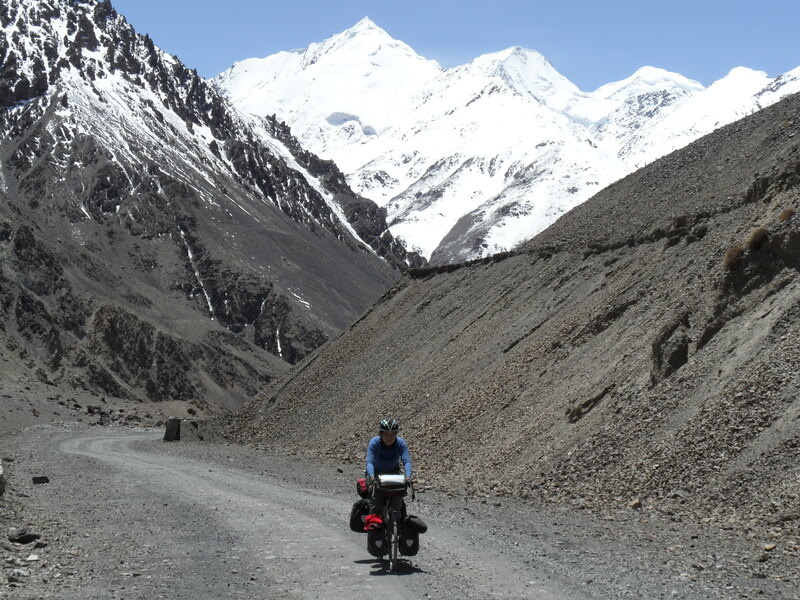 Tuesday 29th May: Today Emily cycled 219km from Karakul to reach Kashgar in China. She says she’s knackered but happy. Monday 28th May: After that challenging bus ride into China, Emily had a rest day in Tashkurgan yesterday and today started the ride through China reaching Karakul. Friday 25th May: Yesterday Emily conquered the Khunjerab pass (4,693 metres). There was no tarmac on the road so it was a very tough climb. She dropped back down into Koksil (4070m) on the way back to Sost as the Chinese require travellers to enter China on the bus, which travels from Sost in Pakistan over the Khunjerab to Tashkurgan in China – she’ll get that bus tomorrow. So, it’s goodbye Pakistan (and thankyou) …….. hello China ! Tuesday 22nd May: After a rest day in Passu, pushed on to Sost (2790m). Sunday 20th May: Left Karimabad and reached Passu (2526m), mostly cycling, but around 12km in a boat !! Saturday 19th May: Still in Karimabad preparing for the upper KKH. This should happen over the next two weeks, up and over the Khunjerab pass and down to Kashgar in China. Wednesday 16th May: On Monday, Emily left Gilgit and rode further up the Karakorum Highway to Minapin. Today she carried on and reached Karimabad where she met up with Michael (dutch rider mentioned previously). Next steps are to carry on up the KKH and leave Pakistan by the end of the month. Saturday 12th May: Emily is spending time in Gilgit before moving on North. Wednesday 9th May: Emily has left Islamabad and is on her way to Gilgit on the Karakorum Highway. From there she’ll cycle up to the Khunjerab pass, and ultimately move into China. Saturday 5th May: After some incredible experiences in the Kaghan valley, Abbottabad, Lahore and Islamabad, Mr & Mrs R make it home to watch the next stage of the trip from the safety of Wales – phew ! Saturday 28th April: Back on the bike we make it to Khanian through mud-slides and broken roads. Although the road recovered fairly quickly after the 2005 earthquake, the constant pressure of the Indian Sub-Continent forcing itself into Asia makes for very difficult travelling conditions. Unfortunately, our cycling stopped there. as we contemplated the best way for Em to get over the Khunjerab pass into China. Thursday 26th April: Emily completed the ride to Shogran to join us and we shared the delights of the Himalayan vista. Walking through Sri Payee to around 3,200 metres we reached what was probably the highest point of our lives before turning back because of the snow fields and thunder storms. Wednesday 25th April: Our bus journey continued from Abbottabad to Mansehra and onto Kawai where the bus became a jeep for the 1300m climb to Shogran. Emily got on the road to chase us down and made it to Mansehra, which if you check out the climbing and descents seemed to me a colossal ride. Tuesday 24th April: Due to a nasty bout of the unmentionables, I couldn’t cycle. So we split up for the alternative route up to the Kaghan valley. I joined Mrs R on the bus to Abbottabad and Emily took another night in Murree trying to deal with that broken spoke. Monday 23rd April: After a day off the plan was to cycle the 48 miles to Muzaffarabad in Kashmir, which seemed like the quickest way up to the Kaghan Valley. After around 26 miles of down-hill to the Kohala bridge we were stopped by the border guards on the frontier with Kashmir. After a lenghty wait for Mrs R we were put on a bus back to Murree (more of that little escapade later). Saturday 21st April: Probably the biggest climb I’ve ever done. After 36 miles of going up, in eight and a half hours, drinking 14 litres of water and listening to 7,651 car horns, we made it to Murree, exhilarated and inspired. You just don’t get climbs like that in Wales. Mrs R caught the bus and had a nice hotel waiting for us when we arrived. Friday 20th April: Mr & Mrs Routemaster made it to Islamabad and after acclimatising and exploring a little, we’re now all ready to move on. Today has seen us all preparing for the the push uphill, into the Kaghan Valley. Emily and I are cycling to Murree where we’ll all meet up to reflect on what might be a tough day – a 1,650 metre climb. Not sure when we’ll next be able to update, but we will. Tuesday 21st February: Emily has arrived in Lahore in Pakistan where she was welcomed by an official reception at the veledrome, hosted by the Cycling Federation of Paksitan. Fantastic ! After a lengthy break, the route out of Pakistan will be over the Karakorum Highway, the Himalayan pass between Pakistan and China. Monday 20th February: Emily travelled from Chichawanti to Okara today and tomorrow will hopefully be the final push into Lahore. I sense that time off in Lahore might provide an opportunity for some blog entries. Saturday 18th February: The first day back on the bike after lifts through the more dangerous parts of southern Pakistan has seen Emily ride the Multan to Chichawanti stretch on her way to Lahore. In Lahore there will be a lengthy break before considering the Karakorum Highway, the Himalayan pass between Pakistan and China. Sunday 12th February: Having slept in a police compound in Nushki in southern Pakistan last night, Emily has now reached Quetta. She was allowed to cycle 20k of the route today, but the rest was in the back of a van while she’s being supported through the dangerous bits. The route from here is unclear, but the destination is Lahore. Thursday 9th February: Emily left Bam today and got as far as Shur Gaz (an average day’s cycling) before being picked up by the local police. She was informed that it was too dangerous to go any further, and was ferried to Zahedan by a series of four different police vans. The police were all nice and friendly, but insisted that Emily stayed in, what turned out to be, an atrociously expensive hotel. An Austrian couple that she met in Bam have also been put in the hotel and it looks like they’ll go to the border together tomorrow. All is well. Goodbye Iran, hello Pakistan. Wednesday 8th February: Still in Bam in Iran, enjoying the surroundings and building reserves for the three-day push to Zahedan, which starts tomorrow. Monday: 6th February: After a long day in the saddle, Emily reached Bam today. Tomorrow’s a rest day before a three-day push to Zahedan for the border crossing into Pakistan. Saturday 4th February: Arrived in Kerman in Iran today and resting up before pushing on to Bam and then Zahedan for the border crossing into Pakistan. Friday 3rd February: After a well-deserved day off the bike on Wednesday, Emily left Yazd yesterday and continued south. After a further ride today she’c camping wild, just east of Rafsanjan. Tuesday 31st January: Now five months into the adventure, Emily arrived in Yazd in Iran today after another one of those very long days in the saddle. It would seem that taking time out to clean your bike really does give you a boost for the following day. Sunday 29th January: A well-deserved day off in Esfahan before moving on to Toodeshk, almost at the geographical centre of Iran. Heading for Yazd. Saturday 28th January: An incredible push yesterday and Emily made it to Esfahan in Iran. “It was a HARD day – one of those big final pushes, like when I rode into Plovdiv or Istanbul, and had been tired for days, and somehow found a hidden reserve of energy at the last minute. The hills have calmed down a bit – I’m heading into the desert now – but there were lots of long long straights, which are tiresome and tedious, and a horrible headwind, so I was pushing pushing pushing the whole way. My feet and back and hands were throbbing by the time I got to the city limits, just as the sun was setting.” Rest day here today before pushing on south. Thursday 26th January: Another good day and now only around a day and a half from Esfahan in Iran. Rode through Golpayegan then across some massive plan hemmed in by snowy mountains on all sides. Rode all the way across the plain and halfway up the pass at the other side, before setting up camp in what appeared to be a series of quarries. Probably won’t hit Esfahan tomorrow, but should on Saturday …. for a pitstop ! Wednesday 25th January: A better day. Currently camped on waste ground in Arak. Heading for Esfahan, Iran. Monday 23rd January: Emily arrived in Hamadan in Iran today and has booked into a hotel for some well-deserved attention to the things that matter. It’s just an overnight stop and she’ll be back on the road tomorrow, heading for Esfahan. Sunday 22nd January: The good vibes are getting through. A tough 72 miler today makes Hamadan in Iran only 62 miles away I think she’s going to try and crack that tomorrow. Saturday 21st January: One of the other cyclists that Emily linked up with broke an axle today and so the day’s cycling has been curtailed to just 45k (to Soltaniye). All is well now and they’ll be back on the road tomorrow, but heading off in different directions. Emily will heading south to Hamadan, which means two hard days over the mountains in sub-zero temperatures. If you have a moment then send her some warm vibes – think she’ll need it ! Friday 20th January: We’ve had a few mapping issues, but I do know that this evening Emily is “camping in another frozen orchard, this time on the eastern outskirts of Zanjan”. She’s linked up with another couple of cyclists. Thursday 19th January: Emily left Tabriz in Iran yesterday and spent last night camped in an orchard 45km before Miyaneh. Tonight she’s in a friendly ambulance station in Soltanabad. It’s been below zero all day, as bad as Turkey. She’s heading for Hamadan and then Esfahan. Monday 16th January: Emily arrived in Tabriz, Iran today, a better day than yesterday. She says that her hosts are lovely and that folk she passes in the street are saying welcome. She may stay a day, but will probably push on south. Saturday 14th January: Emily left Doğubeyazıt in Turkey today and cycled over the border into Iran. The folk she’s encountered so far have been lovely and she’s camping wild, around 10k on from Margan. We still seem to have a signal so fingers-crossed this will continue. If not then we may have a quiet spell. Looking at the blog entries and the pictures, I’m beginning to wish I’d gone with her (doubt if I’d have kept up though). Thursday 12th January: Emily arrived in Doğubeyazıt today and has savoured the spectacular views of Mount Ararat. On Saturday she’ll be moving over the border into Iran and heading for Tabriz in the first instance. Wednesday 11th January: Cycling across Turkey, Emily arrived in Agri today and will hopefully reach Dogubeyazit tomorrow. She’ll probably cross into Iran on Saturday. Tuesday 10th January: Having obtained the visa for Iran in Erzurum in Turkey, Emily today set off towards the border. Staying around Horasan tonight, she’ll be going through Dogubeyazit at some point and then crossing the border maybe Saturday. Thursday 5th Janary: After the four day hike from Sivas in Turkey and two nights of sub-zero wild camping, Emily arrived safely in Erzurum today. She’ll break here a while and hunt down her visa for Iran before pushing on towards the border. Tuesday 3rd Janary: Travelling through eastern Turkey, Emily cycled from Imranli to around 20k east of Refahiye today and has set up camp for the night. It’s cold, very cold, but she’s in her tent wearing her down jacket, four pairs of socks, and eating hot soup. Pretty cosy really ! Monday 2nd Janary: Heading through Eastern Turkey towards Iran, Emily left Sivas today and cycled to Imranli through tough, freezing conditions. She’s currently holed up in a cheap hotel. Sunday 1st Janary 2012: Happy New Year ! Having stayed in Büyüktuzhisar in Turkey on Thursday and Hanli on Friday, Emily hit Sivas yesterday. The plan tomorrow is to head on towards Erzurum and hopefully a visa for Iran. Thursday 29th December: Emily got back on her bike today and cycled from Goreme to Büyüktuzhisar in Turkey where she’s staying with the Mayor and his family (couldn’t find anywhere to camp). Tomorrow she continues travelling east towards Iran. Tuesday 27th December: …. just had a kick in the pants s0 here I am. After leaving the bike in Goreme, Turkey and taking a two week break touring with her sister, Emily is now on her way back to the bike and preparing to hit the road. On Thursday she heads off through eastern Turkey towards Iran. It’s going to be cold ! Monday 12th December: After a couple of nights in Kirsehir, Turkey, Emily arrived in Goreme today. She’ll now have a couple of weeks out of the saddle until after Christmas at which point she’ll carry on cycling east, to Erzurum, Doğubeyazıt and Iran. (So that’s the Routemaster signing off for a couple of weeks – hope you all have a peaceful Christmas). Saturday 10th December: Emily left Ankara in Turkey yesterday and having camped wild last night in a silver birch grove near Karakecili, she rode to Kirsehir today where she’s staying with a couch-surfing friend. She’s continuing to head east. Friday 9th December: After five nights in Ankara Emily set off this morning heading east. It was snowing. She’s camping wild tonight in a silver birch grove just past Karakecili. She’s heading towards Goreme. Monday 5th December: After a four nights of wild camping on the road from Istanbul, Emily arrived in Ankara last night. A rest day today and then it’s east into the Turkish winter, heading for Iran. Thursday 1st December: After the break in Istanbul in Turkey, Emily left yesterday by sailing from the Yenikapi ferry terminal to Yalova and then camping wild near Orhangazi. Today she cycled north of Lake Iznik to Geyve where she’s camping in an apple orchard east of the town. The plan is to reach Ankara within the next two weeks. Wednesday 30th November: OK, back on the road after a break in Istanbul. Today Emily cycled to Yenikapi ferry terminal, then after a lengthy wait got to Yalova just before dark. She’s currently camping behind a petrol station on the outskirts of Orhangazi. The journey down to Ankara has begun ! Tuesday 22nd November: Having left Priseltsi near Varna in Bulgaria on Sunday, Emily has had three hard days in the saddle camping wild and cycling 265 miles to Istanbul, Turkey. She arrived this evening and is safely tucked up in a hostel. She’ll be staying in Istanbul for a while. Monday 21st November: Today Emily crossed the border from Bulgaria into Turkey and is tonight camping behind a restaurant in Kirklareli. Tomorrow she carries on towards Istanbul, Turkey. Sunday 20th November: Today Emily left Priseltsi near Varna in Bulgaria and headed south towards Turkey. She’s now spending her last night on Bulgarian soil camping wild on a hill between Marinka and Krushevec, south of Burgas. Tomorrow she carries on towards Istanbul, Turkey. Saturday 19th November: On Wednesday Emily arrived in Priseltsi near Varna in Bulgaria and after a break in good company she heads off tomorrow towards Istanbul, Turkey where she’ll stay a while before riding on to Ankara. Thursday 17th November: Yesterday Emily arrived in Priseltsi near Varna in Bulgaria. After a small break she’ll be dropping down to Istanbul, Turkey where she’ll stay a while before riding on to Ankara. Wednesday 16th November: “Last night was in a field just west of Shumen. Am still there now, eating breakfast in a frozen tent and watching a big red sun rise over the white fields.” …. that was around 06:00 GMT. Having left Veliko in Bulgaria on Monday, Emily camped wild for a couple of nights and now continues towards Varna and will then drop down to Istanbul, Turkey. Sunday 13th November: From Plovdiv in Bulgaria through Sheynovo and Shivachevo, Emily arrived in Veliko Tarnovo on Friday where she’s been resting up after being ill. Tomorrow she sets off again, aiming for Varna and will then drop down to Istanbul, Turkey. Tuesday 9th November: Emily spent four nights in Plovdiv, Bulgaria before moving on yesterday staying at Sheynovo last night and Shivachevo tonight. Heading north-east, she’s aiming for Varna and will then drop down to Istanbul, Turkey. Friday 4th November: Having arrived in Sofia, Bulgaria yesterday, Emily left early this morning and cycled around 100 miles to Plovdiv where she’ll rest up for a couple of days. Not sure what’ll happen next, but we won’t have long to wait to find out ! Thursday 3rd November: After ten days crossing the Balkans through Montenegro, Kosovo and Serbia, Emily has today arrived in Sofia in Bulgaria. Next stop Plovdiv in Bulgaria and then ….. well let’s see ! Wednesday 2nd November: Today she left Surdulcia in Serbia and crossed the border to Breznik in Bulgaria where she’s preparing for the final push to Sofia. Think we might hear a bit more once she’s settled there. Tuesday 1st November: After leaving Pristina in Kosovo on Sunday, Emily stayed near Gjilan before crossing the border into Serbia to stay between Dobrosin and Lucane. Today she rode on to Surdulcia and tomorrow she’ll be aiming at Sofia in Bulgaria (where hopefully she’ll find an Internet Cafe to let us all know what the Balkans were like). Sunday 30th October: After crossing the Cakor pass at 1,859 metres, Emily stayed near Pec before riding on to Pristina in Kosovo yesterday. The plan today is to ride out of Kosovo into Serbia.